Straddles the Ulster/Sullivan County border along the southern edge of the Catskill Park, approximately 6 miles northwest of the Village of Ellenville and more than 65 miles northwest of New York City. Formed by the damming of Rondout Creek, which continues northeastward and eventually drains into the Hudson River at Kingston. Consists of one basin, almost 6.5 miles long; holds 49.6 billion gallons at full capacity. Placed into service in 1950. 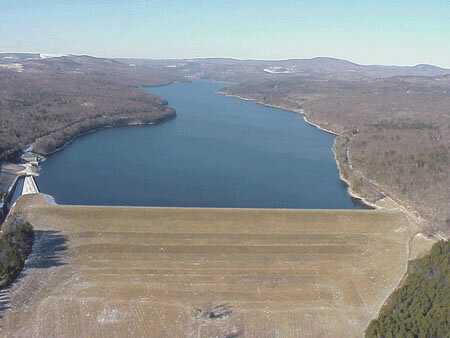 The Rondout is one of four reservoirs in the City's Delaware system. It serves as the central collecting reservoir for the Delaware system, receiving water from the Pepacton, Cannonsville and Neversink Reservoirs. Since the Delaware system supplies approximately 50% of New York City's water, the Rondout plays a critical role in the City's overall Water Supply System. The Rondout also receives water from its own watershed. Water from the Rondout heads southeast in the 85-mile long Delaware Aqueduct, which tunnels below the Hudson River. Rondout water ordinarily makes its way to the West Branch and then the Kensico Reservoir for further settling. After mixing with Catskill system water, it leaves Kensico through aqueducts to reach the Hillview Reservoir in Yonkers, at the City's northern boundary, where it enters the water supply distribution system. The Rondout's watershed drainage basin is 95 square miles and takes in parts of seven towns: Fallsburg and Neversink in Sullivan County, and Denning, Olive, Rochester, Shandaken and Wawarsing in Ulster County.